Barmouth / Abermaw at Barmouth/Abermaw01341 280787workWaypointBarmouth, or Abermaw or even Y Bermo as it is known in Welsh, has officially been 'Beautiful' for over a century. Amongst the notable buildings in the town are the medieval Ty Gwyn tower house and the nineteenth century Ty Crwn roundhouse prison. Another building in the centre of town which has shot to fame - or infamy - in recent years is the 'Arousal Café'. Originally named Carousel Café, the letter C was stolen soon after the sign was put up. 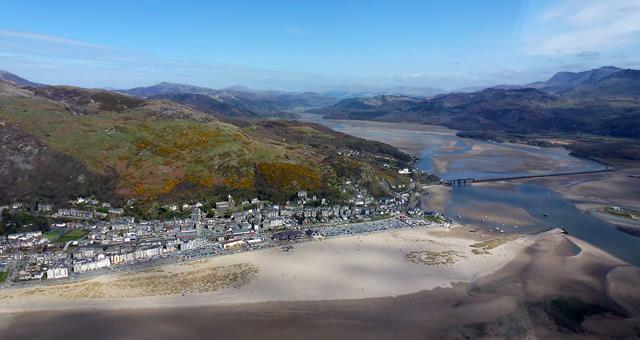 Barmouth, or Abermaw or even Y Bermo as it is known in Welsh, has officially been 'Beautiful' for over a century. The owner has regularly attempted to replace the C letter, only to find it missing again the following day. At the time of writing, he has ceased trying to reinstate the 'C'.